Cars are getting chatty. The U.S. Department of Transportation, National Highway Traffic Safety Administration, and the University of Michigan are currently testing “vehicle-to-vehicle” (V2V) technology, which allows cars to sense each other and the environment and, hopefully, anticipate crashes. Mercedes-Benz is getting in on the action too. The company announced that it will put its own V2V system, called Car-to-X in the hands of drivers by the end of the year. Like the V2V systems being tested in Michigan, Car-to-X is intended as an early warning system that can identify hazards and warn the driver, potentially giving them enough time to prevent a crash. Initially, Car-to-X won’t be fully integrated with a Mercedes’ hardware. It will work through a smartphone app called Digital DriveStyle, which receives data and feeds it to the car’s onboard displays. This may sound like an aftermarket job, and that’s because it is: By packaging Car-to-X in this way, Mercedes says owners will be able to retrofit any car they want with the system. Once it’s synced, Car-to-X will scan the airwaves for warnings from emergency services and reports on bad weather. 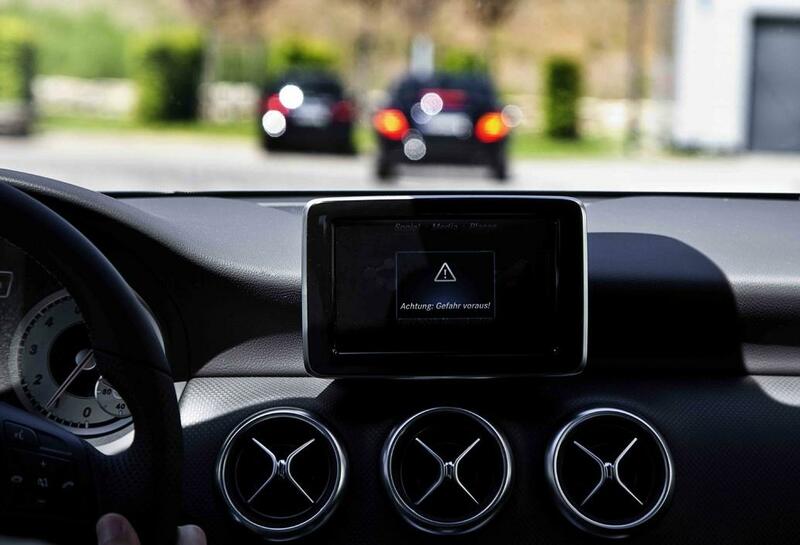 Since Mercedes cars already come equipped with a variety of sensors, they can also transmit and receive information on road conditions. This is where the “talking” aspect comes in: As a car approaches an obstacle, such as a crash or a patch of bad weather, it will receive warnings from other cars that have recently passed through the area, and then pass the message on. It’s like a robotic version of crowd-sourcing. However, drivers have to manually activate the notifications by pressing a button. This should cut down on distracted driving, but it won’t help drivers in urgent situations, such as wrong-way driving or when they are rapidly approaching an obstacle. The system is also limited by how many cars are part of the network. For now, only Mercedes vehicles will be able to talk to each other with Car-to-X, although Mercedes would also like to equip emergency maintenance vehicles with the system to enhance its effectiveness. These flaws don’t worry Mercedes, which considers Car-to-X a work in progress and a stepping stone to future technologies. “With Car-to-X communication we have made a base technology ready for the market which in the future will enable a new generation of driver assistance systems to be developed,” said Prof. Dr. Thomas Weber, the Daimler AG board member in charge of Mercedes cars. Do you think “talking” cars can improve road safety? Tell us in the comments.